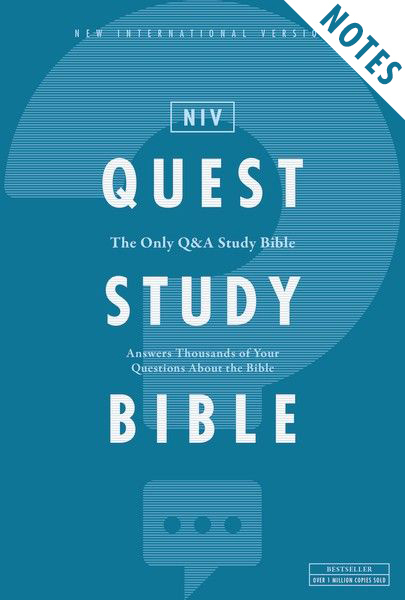 The Quest Study Bible Notes answer your questions. Over 7,000 notes shed textual, theological, and historical light on the Bible’s most puzzling passages. Nearly 350 articles by top scholars address some of the most popular and provocative questions asked by Christians and non-Christians. An article index and expanded subject index help you quickly find the answers you’re looking for. The Quest question-and-answer Bible Notes are like no other: study Bible notes that assists your journey to the meaning and heart of the Scriptures with notes that answer the questions you’ve always had about the Bible. Need a Bible? Get the NIV for free, here!